16th of April, 2015, titled “the Centenary of Armenian Genocide”. 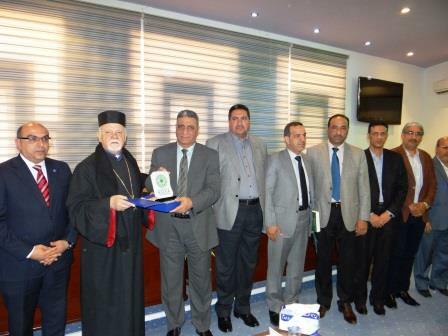 The symposium was held in collaboration with the Iraqi Council of Religions Dialogue, and presented by Al Matran Afak Asadorian, the President of the Council of Christian Communities Heads in Iraq, Malakon Malakonian, Chairman of the Armenian Orthodox Affairs in Basra and Sako Bako, a member of the Provincial Council in Basra. In addition to the participation of Saad Saloom, specialized in Religious minorities, in a research paper. The symposium focused on the genocide of Armenian and robbery of rights and freedoms. it’s objectives were spreading respect, peace and love among all religions and communities. 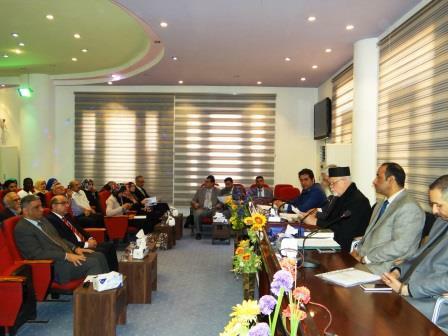 The symposium was attended by the President of the University, Prof. Akeel Yasseen, Prof Aqeel Al-Khakani, Dean of the Faculty of Arts, Dr. Hassan Nadhem, Chairholder – UNESCO Chair , Faris Harram, President of the Union of Iraqi Writers in Najaf, and faculty members from many faculties.